The easiest to use home inspection management software system in the industry. Modules are available via an affordable monthly subscription plan which includes use of the software, support and free updates for each subscription. Subscriptions require no long term contract....just pay the first three months subscription fees and a minimal setup fee*. *Required setup fee for Desktop users is $99. Required setup fee for multi-user server clients is $199. Individual modules can be turned on or off with the click of a button. All prices quoted for individual users. Contact the office for quotes for multi-users. Select from the following links to view sample reports. 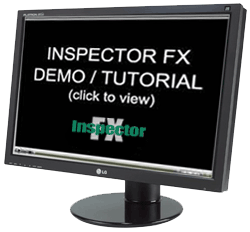 GHI (General Home Inspection) - The foundation of Inspector FX reports. GHI allows you to insert your color logo and digital signature. The module includes check boxes, user configurable drop down boxes (value lists), and customizable comment library. Photo Manager allows you to import all inspection photos in a single click. Optional Texas TREC format included. Order Entry - Designed with the experience of managing over 40,000 home inspection reports a year. Enables a one man practice or multi-inspector organization to operate at maximum efficiency. Marketing (CRM) - Contact Relationship Management for the home inspector. Allows you to view a customer's order history, contactl history, create emails and write personalized letters. Everything is stored in the customer's history. Will export to Constant Contact or other email marketing programs. ProForms Inspections - Each form includes Photo Manager & Addendum. Roof, Well, Septic, Pool/Spa or Custom @ $10 per month each. Radon, ERC, NFPA Level II standalone @ $40 per month each or $20 per month if with GHI. Termite Inspection Option - Subscription @ $20 per month when purchased with GHI. Includes our WDI FX Inspection module, the industry's oldest and best selling termite inspection report writing system, includes NPMA-33 and all mandated state forms. WDI FX is the industry's premier wood destroying insect inspection reporting writing system. Includes Photo Manager, NPMA-33 and all state forms. This tool is required in order to combine multiple IfX report pages, invoices, pre-inspection forms etc., into a single file (unless you wish to purchase the more expensive Adobe Acrobat). pdfFactory offers a 30 day watermarked trial download on their web page. The purchase price after 30 days is $49.95.